By: Anonymous; Thomas, Andrew R.
In the last few years, several planes have almost gone down because of the aberrant or abusive behavior of one or more individuals. Unfortunately, such outbursts are becoming increasingly common. These dangerous actions -known as air rage - are by far the greatest threat to the safety and security of the 1.5 billion passengers who travel annually by air. Although the number of air-rage cases continues to rise, airlines, airports, and even governmental agencies consistently underreport the scope of the problem, thus exacerbating an already volatile situation. This intensively researched book by an anonymous veteran insider of the airline industry and an experienced investigative journalist provides reliable, detailed research never before reported. The book fully explores the fundamental causes of air rage: alcohol and illegal drug abuse, mental illness, overcrowded airplanes, the economic realities of the airline business, the failure to report air-rage incidents, and the lack of consequences for perpetrators. 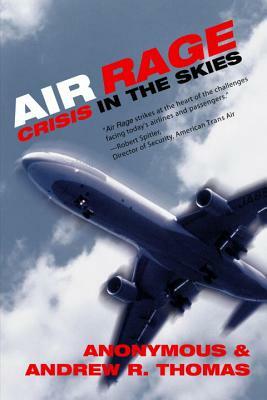 Each point is illustrated through recounting actual air-rage incidents that the authors have collected from interviews with flight crews and passengers and/or through their Web site at www.AirRage.org. Without being alarmist in tone, this important book will make readers aware of the scope and magnitude of the air-rage problem and what might be done to solve this emerging crisis in the skies. See also Andrew Thomas's Aviation Insecurity: The New Challenges of Air Travel. Author Name: Anonymous; Thomas, Andrew R.